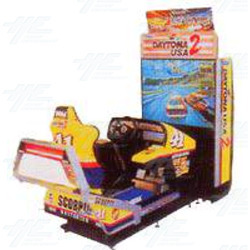 Daytona 2 is the sequel to Daytona, a stock car racing simulator where the player is placed in a high-speed stock car race. The player will have to master the art of power sliding and more in order to gain mastery of the 3 courses. There are three different cars to choose from, each with their own difficulty (easy/normal/hard. Players can also select multiple viewing angles. A new feature, the crash impact generator, delivers shocks to the players back and soles of their feet upon impact, including the feel of the engines rumbling. The player will have to master the art of power sliding and more in order to gain mastery of the 3 courses. There are three different cars to choose from, each with their own difficulty (easy/normal/hard. Players can also select multiple viewing angles. A new feature, the crash impact generator, delivers shocks to the players back and soles of their feet upon impact, including the feel of the engines rumbling.